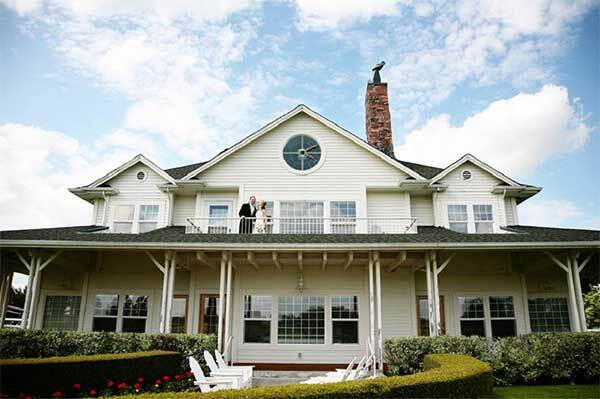 Whether you are drawn by the charm of a barn wedding, or captivated by the emerald golf greens and vibrant flowers, Langdon Farms offers premiere wedding venues unlike any other in Portland and we’re just 15 miles south of downtown. Our beautiful wedding venues provide couples and guests with a breathtaking place for their nuptials. From the Red Shed ceremony lawn, where couples can share their first married kiss surrounded by vibrant flowers, to the Red Shed, a flexible reception venue that can either feel outside under cover in the warmer months or act as a cozy and romantic venue in the winter. 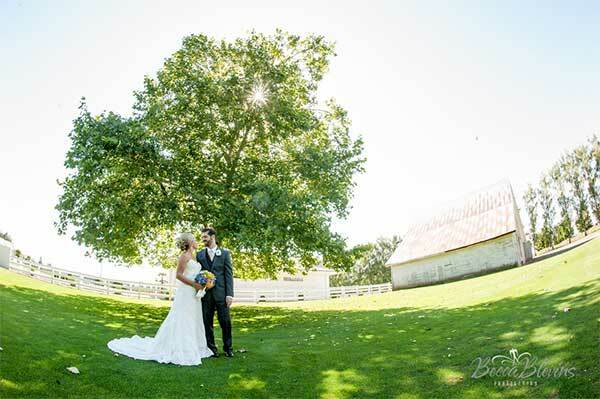 The White House completes our wedding venues with its spacious farm house feel where brides and grooms-to-be finish their final touches in comfort, and take in the amazing view from the back porch. 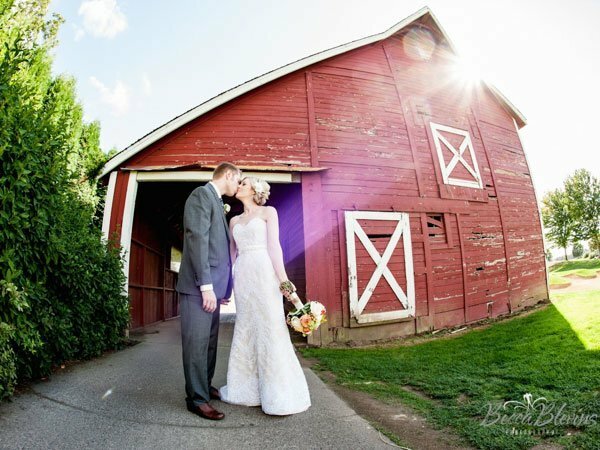 Langdon Farms was my dream wedding venue before I even met my husband! Our wedding day was better than I imagined. Langdon Farms was one of the best values I found in Portland in terms of how much they have to offer, and how reasonable their pricing is with a large variety of options. Katrina was so kind and helpful with any question we had throughout the whole process, from first meeting to day of when they set up our site. Could not have been happier or had a better time. Katrina is a doll and went out of her way to make it as easy as she could for us. 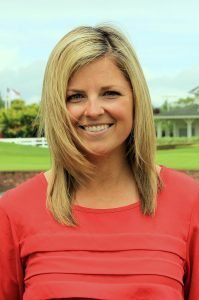 I don’t even know where to start with this review – I have so many good things to say about Lisa, Staff and Langdon Farms Golf Club. 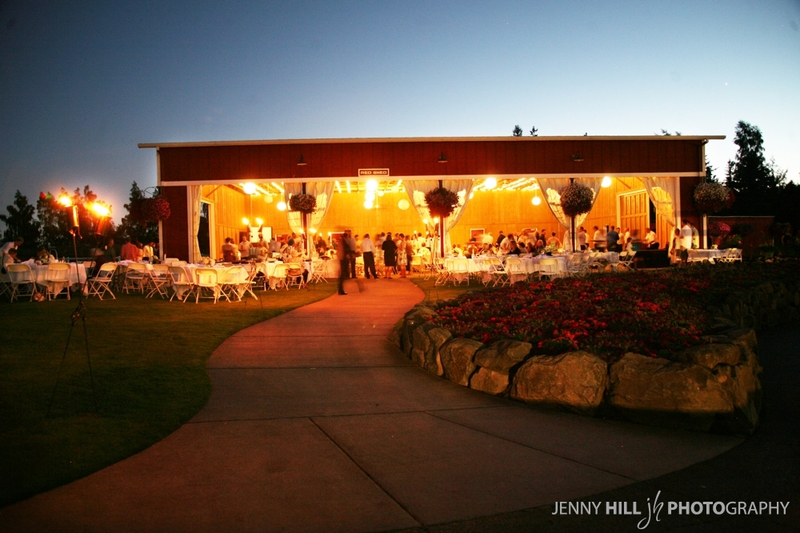 In addition to the Red Shed Lawn ceremony overlooking the golf course, we also offer The Orchards featuring hanging floral baskets, a natural canopy of tall trees providing privacy and a mature sycamore tree as a beautiful country wedding backdrop. 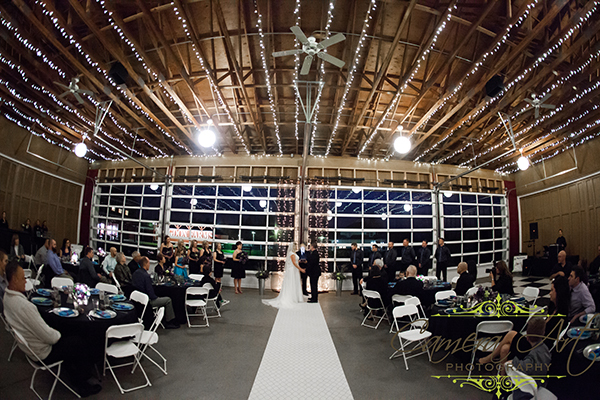 In the winter months, ceremonies are held in The Red Shed which is easily transformed into a cozy, romantic indoor barn venue. 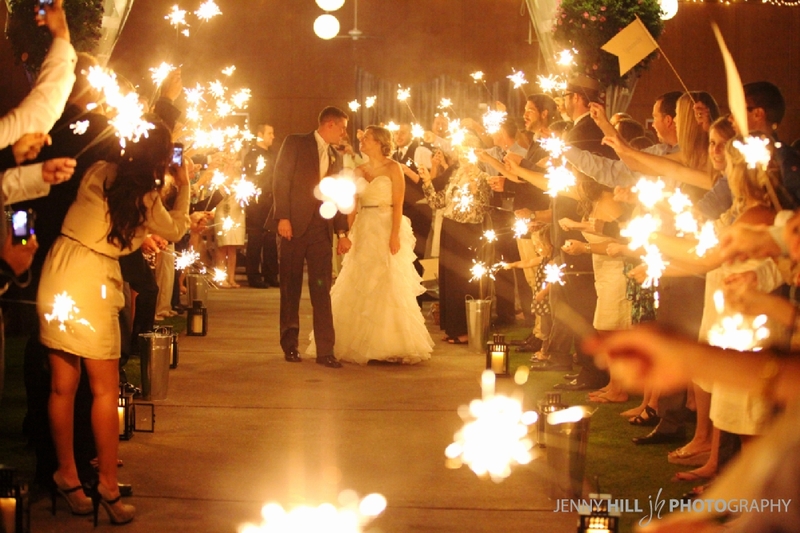 High, rustic ceilings and twinkle lights create a soft glow that captivates your guests. The Red Shed has glass rolling doors that can keep you warm and secure when the weather is not ideal, but also has an enormous open-air capacity for when the sun is shining. Our grounds are easy to get around. We welcome children so long as parents are mindful about supervising them, service animals, and even your beloved pooch as ring bearer! Just about everything is on the ground floor, so there is ease of access for disabled guests. 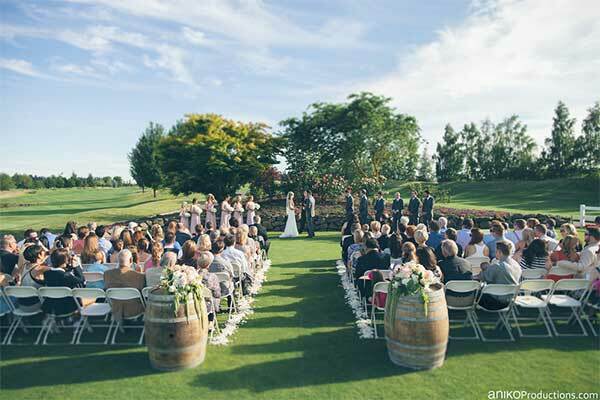 Overlooking the 18th green, the Red Shed Lawn is our most popular spot for wedding ceremonies. Surrounded by a coral bark maple, cherry and dogwood tree, as well as vibrant flower beds, it is the perfect outdoor wedding venue. 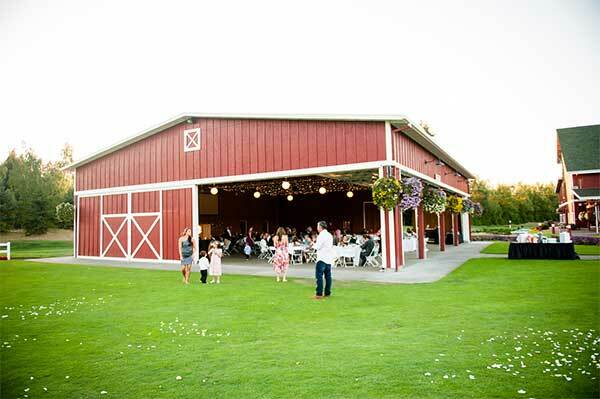 Move effortlessly from your ceremony on the Red Shed Lawn to the rustic, open-air design of the Red Shed. It can accommodate 300 guests inside, while in the summer months, additional guests can be seated on the surrounding lawn. Built by the architects to call home while the course was being created, The White House offers a generous and comfortable space for last-minute touches to hair and make-up before venturing out into the lush surroundings for photos. 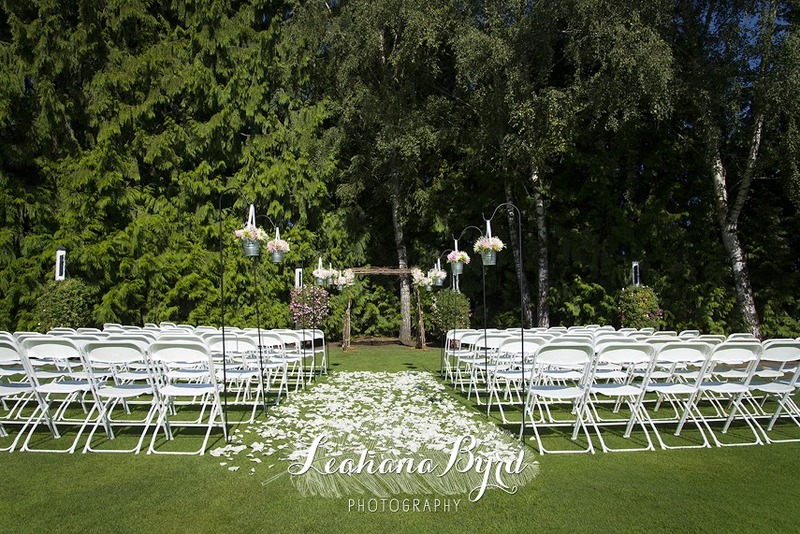 The Orchards is a beautiful venue for your ceremony. Surrounded by a canopy of trees and hanging flower baskets, it offers an amazing escape. A mature sycamore tree or a shaded corner can provide a perfect backdrop for the ceremony. 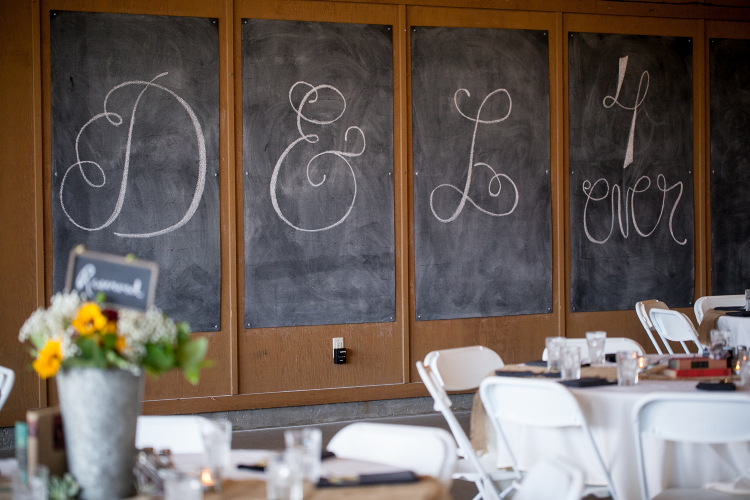 Imagine a picture-perfect wedding among the natural beauty of classic Portland, Oregon countryside. Dream of the lovely scents provided by nearby trees and flowers, blowing by on a soft breeze as your fiancé becomes your spouse. Think of how happy you will feel as each and every one of your wedding guests tells you “what a beautiful wedding!” during the reception, and for years to come. From the moment a tour is taken to the end of the reception, our premiere wedding venue leaves a strong impression. 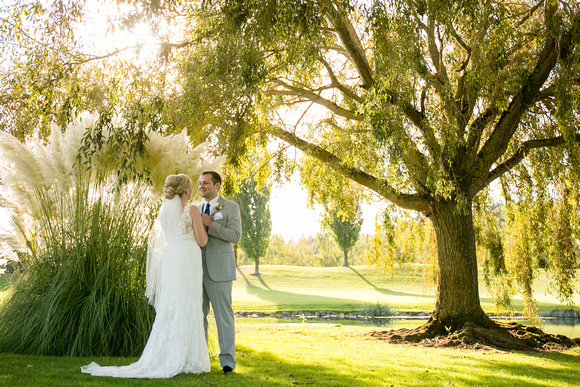 Friends and family are welcome to book a tee time, to stroll among the gorgeous, rustic grounds in The Orchards, and to indulge in one of the highest-rated wedding venues in Portland, Oregon. 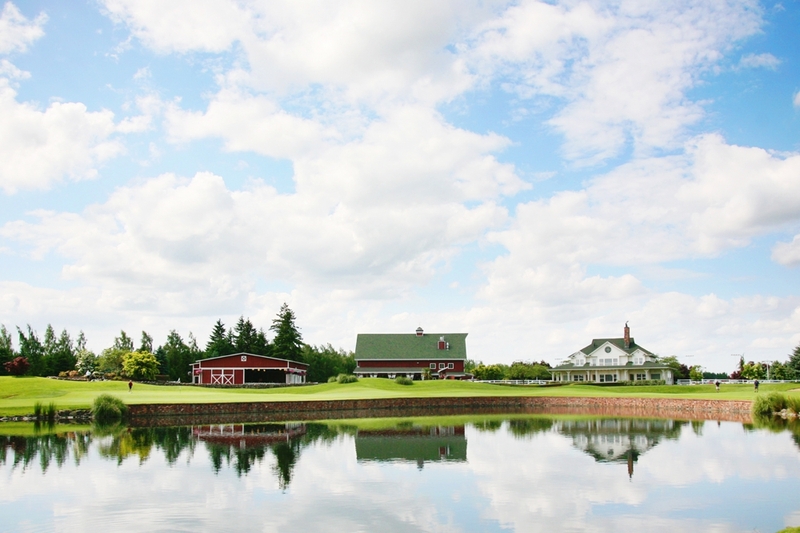 At Langdon Farms, it is our desire to turn your dream into your reality. We focus on offering a country wedding experience that features impeccable service and support from our on-site wedding coordinators. Each member of our team strives to ensure a relaxing, gracious atmosphere for guests. In other words, our wedding team works hard so that you do not have to. 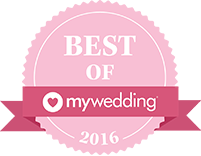 We focus on the details from day one so you are free to enjoy the big day! As the exclusive on-site caterer, our wide variety of menus will fit your desire and budget. Food and bar packages are based on a per person price, so an estimate is easy to pencil out. Catering minimums and a 20% service gratuity apply, so be sure to ask about the specifics for your chosen day and time. Special dietary needs are always accommodated and menus can be easily customized. On the big day, the last thing you want to be worried about is coordinating your wedding. Without a coordinated wedding planner, usually a close relative or friend is running around anxiously trying to keep it all together. 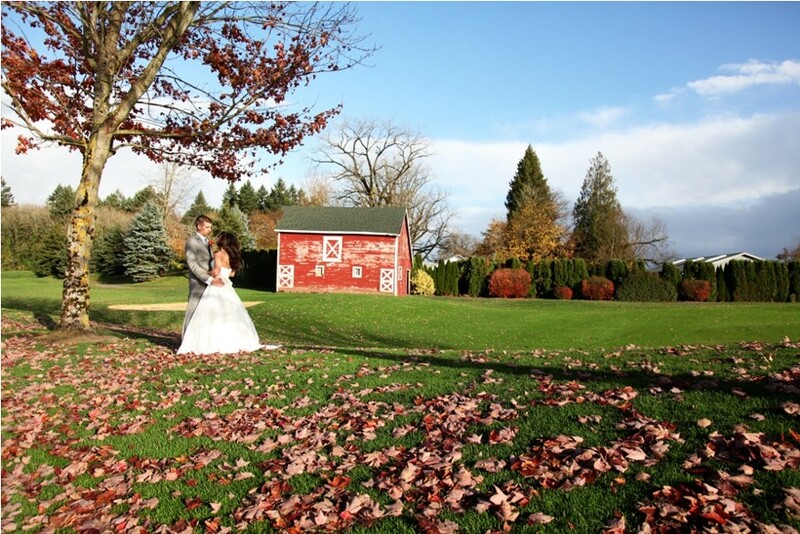 At Langdon Farms, we begin planning every detail three months in advance, so there are no surprises on your wedding day. We lay out a detailed agenda including: a timeline of the day, the menu, the bar menu, decorations, ceremony & reception layouts….all of it! We are meticulous about the details! 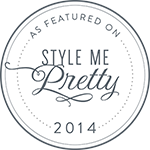 On the day-of, we work with your preferred vendors (photographer, DJ, florist, cake, etc.) and make sure everybody knows where to go when they arrive. Our on-site wedding coordinators have helped plan hundreds of weddings at Langdon Farms, so we draw on that experience to ensure your wedding proceeds flawlessly.